Before I started my blog, I worked as an accountant in public practice in Alberta and Ontario. I left the workforce in 2007 because of chronic pain, but I still did people’s taxes if they asked me too. Now that I’m blogging AND earning an income (finally! ), I understand how important it is to keep good records. It’s not only tedious to figure out your income and expenses from a box of receipts, but also if you are paying an accountant to do your taxes they WILL bill you for the time it takes them to go through your stuff. It’s just easier when you finally sit down to do your taxes to have everything all ready done and all you really have to do is plug in your numbers to your tax forms. You don’t need any fancy accounting programs either to make it work. Just use a spreadsheet program like Excel or do what I do and use Google docs (free). This is very straightforward. I use cash basis accounting meaning I record my income when I actually receive the cash in hand. This means I receive a cheque in the mail or a deposit in my Paypal account. I record in whatever month we are in- who the payment is from and the net amount received in the appropriate column (Paid Posts, Advertising, etc). At month end, I take a total of all the columns for that month and then I know how much I took in for that particular month. I used to rely on my memory and I’m sure that I got ripped off because of it. Now, I have a separate sheet in my Income spreadsheet called Accounts Receivables whose sole purpose is to keep track of who owes me money. Think of it like your own little collections file. Now I know most of us like to be paid upfront, but sometimes that does not happen. This sheet will help so you don’t have to rely on memory. After the post or service is completed, add the date, company name, description of service and amount owed in the Accounts Receivable sheet. This is a running list that can be added to throughout the year. As someone pays you, you just delete their information from the list. At month end, I follow up via email with people that haven’t yet paid over 30 days. Then I record in the Notes section the date I emailed them. In Canada, March & April is considered Tax Season and is when we are busy calculating what we made the previous year. I use the Year End Totals sheet to take the total off each of the monthly sheet to add them together to come to the amount I made for that year. Then it’s a matter of plugging that income into the appropriate tax form. I don’t have to scour bank statements or Paypal statements. I’ve created a Blogging Income Spreadsheet that you are welcome to make a copy of and use to keep track of your own income. Just go to File and then Make a Copy and name it something that appropriate for you like YourBlogName 2012 Blogging Income. Start it now and at least you will have a few months organized and only have to do the previous 8 months. 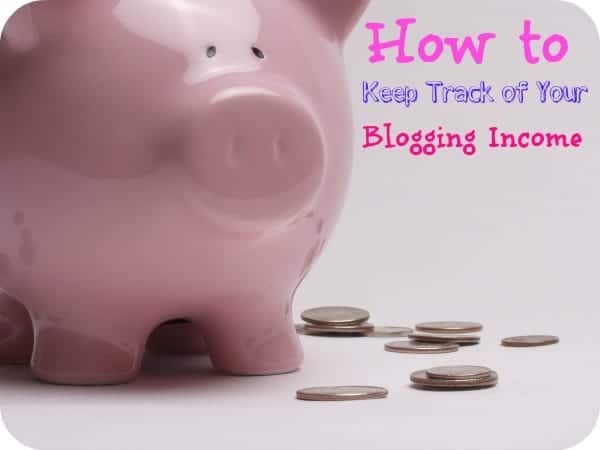 How do you currently keep track of your blogging income?